In the competitive start-up world, even the shrewdest entrepreneurs — with the latest and greatest gadgets — can find themselves thrown unexpectedly into legal quagmires that could derail or blow up a dream before it gets off the ground. Sometimes it’s a simple oversight. Other times, a fresh-faced business owner tries to save a few dollars by ignoring such issues as liability, patents, copyright and taxes. But many of these business-killers are not only foreseeable, but preventable as well, experts say. And several who have paid heed have avoided potential business land mines. When Josh York, a 33-year-old fitness buff, decided to create a mobile personal training company, called GymGuyz , in 2008, he knew he would need insurance. His company, based in Plainview, N.Y., offers a “gym on wheels”: a personal trainer loads up a van with more than 300 pieces of fitness equipment — like dumbbells and resistance bands — and travels to a client’s home, workplace, school or park to give a personal workout session. “I didn’t start training anyone until I had the insurance,” said Mr. York, who has a bachelor’s degree in business administration from the C. W. Post campus of Long Island University. But getting insurers on board wasn’t easy. He contacted five companies before finding one that would sign him on. Mr. York had to demonstrate that he could strap down the equipment in the van to reduce the risk of road accidents and that his certification as a personal trainer reduced the chance that clients would be injured. Initially, he tried to save money by not insuring his equipment, thinking that it would be safe while locked in a van. Nevertheless, after one van was vandalized in 2014, he started insuring the equipment as well. Insurance to cover liabilities is often an afterthought for many start-ups, but it should often be at the top of the list. A manufacturing defect, an injury to an employee or customer, or even a hacker breach of a payment system or website could lead to a lawsuit and kill a budding start-up. Other legal issues can also trip up companies. Mr. York, for instance, got a trademark on his logo right away and bought both spellings of the domain name — GymGuyz and GymGuys — to protect himself from copycats. Undaunted by the skeptics, Mr. York pushed ahead. His company will have franchises in 100 markets in 18 states by year-end, up from one location eight years ago. Its revenue, which totaled $101,000 in 2008, is on track to reach $5.5 million this year from the company-owned business and franchise fees. Sky Zone , an indoor trampoline park operator based in Los Angeles, also faced a skeptical reception when it tried to obtain insurance in 2004. The company owns the patent on the “trampoline court,” a web of trampolines that are interconnected, allowing jumpers to move among them. When would-be underwriters heard the word trampoline, many conjured up visions of 1960s-style backyard trampolines, where reports were rampant of people tumbling off and being rushed to hospitals with broken bones. “We went to six to 10 insurers” before finding one that would provide coverage, said Jeff Platt, chief executive of Sky Zone. It took considerable time to educate insurance brokers about the netting, safety guards, rules and monitoring staff before he could convince a company that the injury risk at his parks was low. “The only way to fall off of our trampolines would be to climb up a trampoline wall, then climb up about seven feet of netting and then literally jump over it,” Mr. Platt said. Mr. Platt said he was constantly learning about new liabilities and addressing them. In 2012, he installed cameras inside and outside the parks after a break-in. In 2014, Sky Zone faced a security breach of one park’s pay systems, where a small number of credit card numbers were stolen. Mr. Platt quickly brought in security experts to fix the breach and monitor the systems at all the parks. His vigilance has paid off. 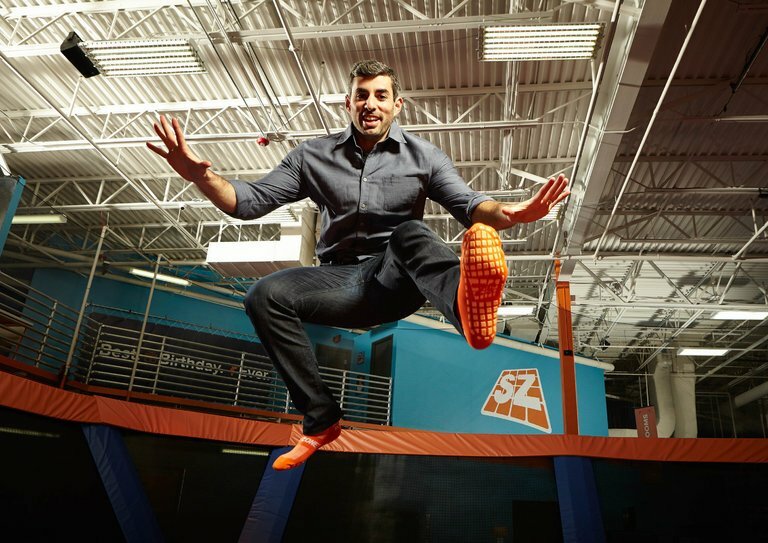 Sky Zone owns four parks and holds franchises in 175 locations in six countries. Its revenue, which stood at $800,000 in its first full year in 2005, rose to $54.1 million from company-owned parks and franchise fees in 2015. It is on track to reach $60.1 million this year. One start-up, Dolly , brought on an insurance broker and legal counsel as investors to help the company address liability and regulatory issues. Dolly’s Uber-like mobile app connects people who want to move furniture or other items with people who own trucks, vans or large sport utility vehicles. Mike Howell, 38, a Seattle resident with a degree from the London School of Economics, is a co-founder of Dolly, which began in 2014. He said insurers were initially reluctant to sign on, fearing that the risk of damage or injury would be high for a business that relied on someone with no moving expertise to transport furniture and other items from one location to another. But Mr. Howell said underwriters misunderstood the business. Dolly is aimed at consumers who want a fast, cheap and easy way to move a small number of items from one apartment or store to another. It is not competing with moving companies that deal with the entire contents of a house. Most moves involve fewer than five items and cost an average of $80. Dolly picks up a 15 percent to 25 percent commission on each move. Damage has been reported in fewer than 1 percent of the 100,000 moves Dolly has done, according to Mr. Howell. “We now have an investor who’s a big-time insurance broker” and advises the company on insurance matters, Mr. Howell said. Dolly has raised about $10 million in financing, with Jeffrey A. Wilke, chief executive of Amazon’s worldwide consumer unit, among the investors. Patent, ownership and copyright issues could also sink a company if not addressed. Some cash-short entrepreneurs opt to skip the search for patents and trademarks to save money — and that’s a mistake, warned Allan H. Cohen, managing partner at Nixon Peabody’s Long Island law office. He recalled one client who built a health care app, adopted a name, and then spent tens of thousands of dollars developing a logo, website and marketing materials using that name. However, when a trademark search was later conducted, the company discovered that the name was already being used by a small firm in another state. The client, however, did not want to change the name, and is now gambling that the company will not be sued. But company owners who want to be a huge success should pay heed, Mr. Cohen said. “They could get a cease-and-desist order and have to stop using the name or be sued,” he said. Taxes are also often overlooked out of concern over costs — but some tax provisions can actually be beneficial. Some programs, such as the angel investor tax credit available in some states, can make raising money easier. And the federal research and development tax credit can save money on a start-up’s tax returns, said Mitchell Kopelman, a certified public accountant and a partner at HA&W, a business advisory firm in Atlanta. All of these crucial issues should be addressed early and re-examined as a company grows.